Membership now OPEN for renewal and new applications. Please use the on-line membership process as your first choice for applications & renewals. All members or other persons who attend club tours or meets do so at their own risk. Neither the Club nor its officers can accept any liability for any loss or injury of any kind sustained at headquarters or whilst on a Club tour, meet or other activity. Please note that third party insurance and liability whilst taking part in Club activities is included, however members are advised to make their own arrangements regarding personal accident insurance. Click here to read our Members Data Processing Notice. To complete Membership applications for those under the age of 18. To check in with the organiser and to collect their child at the arranged times. To ensure that the child has a complete change of clothing, towel, waterproof anorak, woollen hat and a pair of trainers or wet boots for summer paddling. To ensure that adequate THERMAL and WIND / WATERPROOF clothing is worn for winter paddling from October to March. To ensure that the child will confirm to all the rules and regulations of the club. To give permission for the child to receive medical treatment in an emergency. The minimum age to become a club member is 11 years. We would also like to encourage you to tick the 'Gift Aid' box on this year's form if you are an income tax payer. Families = family units comprising up to 2 adults plus any number of dependent children. Youths �30 Those in full time education. Family �100 One membership form per member of the family. Social �10 Social membership is for non-canoeing family to be part of the club and attend events. (Note: new key fobs need to be requested separately as there may be key deposit now). NOTE: Payment by Cash, Cheque or BACS only for Key Fobs please (NOT PAYPAL). If you no longer want you fob please return it with a short note to the canoe club. Remember - You cannot drive your car into the marina without a valid pass. 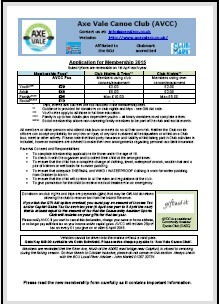 As a back-up, there is a copy of the membership form which can be filled in and handed to the Treasurer. We also have a Welfare Officer who may be able to help if you have limited income or other extenuating circumstances - phone our Welfare Office (Helen) whose number is shown on the contacts page.